Throwback Thursday: Check out this video from February's Night of Dreams! The Chester Community Charter School hosted its Night of Dreams Black History program on February 28, 2019. Students showcased the last hundred years of a people whose brilliance, strength and resilience have earned them a place in this world that is second to none. Save the date! The CCCS Spring Concerts & Art Shows are coming up next month! On Friday, Curiosity Hall (East B) celebrated their scholars whom achieved excellence during the second trimester. Students earning 1st Honors, Distinguished Honors and Perfect Attendance received certificates and medals recognizing them of their achievements. Some students even received $25 gift cards for their positive growth using the online i-Ready program. The highlight of the celebration was a performance by Chester Community Charter Schools Harambee Drill Team. West B had their First Annual Career Day on March 8, 2019. The scholars had a very exciting day and engaged in informational sessions touching on a wide variety of careers. Careers that were represented included Doctors, Radio Disc Jockeys, Lawyers, Barbers, Event planners, Film Editors, Finance Managers and State Representatives. These professionals from all over the Delaware Valley gave engaging and informative descriptions of their careers. Multiple CCCS Scholars expressed their gratitude for the day saying it was one of their most favorite days of the school year and they couldn’t wait until career day next year. Click the link below to view more pictures from West B’s First Annual Career Day. Chester Community Charter School’s annual Read Across America honors Aston Principal Alphonso Evans, the author of “Tell Them They’re Great – I Dare You!” Thank you for joining our celebration! Upland's Annual "Living Wax Museum" is 3/5/19, mark your calendars! Chester Mayor, Thaddeus Kirkland, visited Chester Community Charter School’s Curosity Hall today, February 21, 2019, to read aloud to Ms. Janay Winston’s third grade scholars! Mary Mohoney, one of the first Black nurses from the Revolutionary Period. Marian Anderson, famous opera singer. & Althea Gibson, groundbreaking tennis star. CCCS CEO Dr. David Clark introduced the mayor and accompanying city council members to the eager classroom. Following the reading, the young scholars joined the mayor in a lively discussion of black history and education! 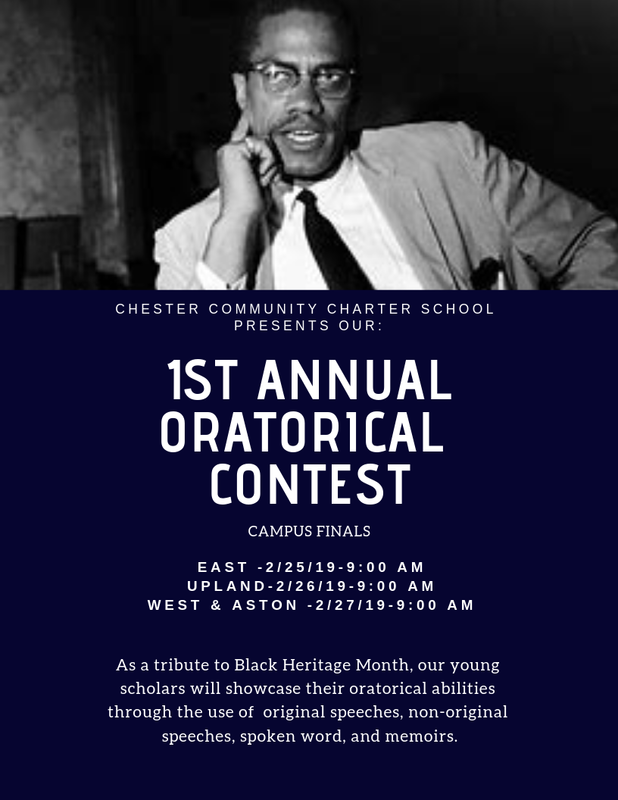 The Chester Community Charter School is hosting it's 2019 Night of Dreams Black History program! We will showcase the last one hundred years of a people whose brilliance, strength and resilience have earned them a place in this world that is second to none. It will highlight segments of our accomplishments from the last ten decades. The Strengthening Families Program (SFP) fosters positive family relationships, reduces family risk for substance abuse in adolescence and builds strategies to counteract aggressive, hostile behavior. In this workshop series your family’s relationships will improve and strengthen through weekly parent effectiveness training and child skills-building, followed by a family session. Be a part of developing skills of conflict resolution and communication! Participants engage in activities to increase family cohesiveness and positive involvement of the child(ren) in the family. Chester Community Charter School is proposing an afterschool program for students and families located in the Southwest and West Philly areas, specifically zip codes including 19143, 19142 and 19153. If you are located in any of these areas, please fill out the survey to be considered for enrollment in the Philly afterschool program. Pending funding, the program will begin this summer and run through the 2019-2020 academic school year, from Monday-Friday 3:45pm-6:15 pm, dinner will be provided. We only have room for 200 students, EARLY pre-enrollment is encouraged! On Tuesday, January 15, 2019, Cigna Insurence partnered with Chester Community Charter School's Blessings In a Backpack initiative. Blessings in a Backpack, "mobilizes communities, individuals, and resources to provide food on the weekends for elementary school children across America who might otherwise go hungry," said Vee Young, Chester Community Charter School's Director of Food Services. Starting this year, Cigna has dedicated their organization, Healthier Kids for Our Future, to gift $25 million over a five-year global initiative to improve the health and well-being of children. They kicked off this initiative yesterday with our very own Chester Community Charter School. 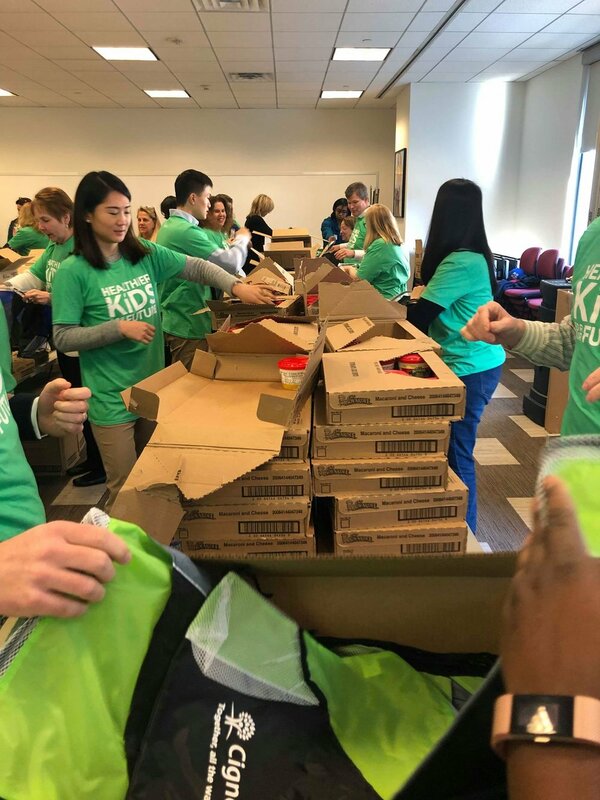 Ms. Young attended the event yesterday at the Cigna offices in Philadelphia, Pennsylvania where over two hundred employees packed backpacks full of non- perishable food to be given out to the scholars of CCCS. As Cigna employees volunteered their time filling up the backpacks throughout four different sessions that day, Steve Rech, Senior Director at Cigna, spoke about how happy he was to give back to the Chester community. "I love Chester, I lived there my entire life, it was where my dad worked and I grew up. This program is so great because it sees a need and is taking action." Rech and Young both shared stories as they worked of their childhood memories in the community. 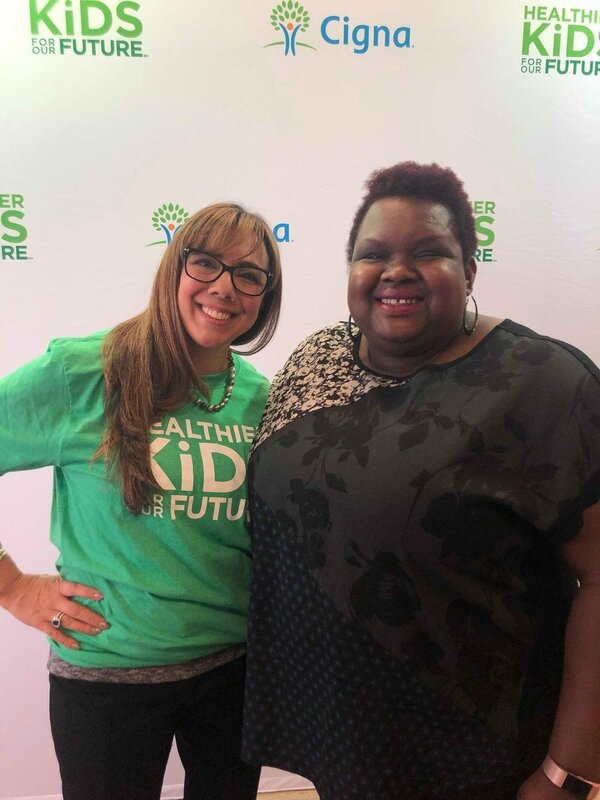 Healthier Kids for Our Future is looking to partner with Chester Community Charter School more over their five-year plan to find ways they can use their allotment to help our school community flourish even more. CCCS BASKETBALL HIGH SCORING HISTORY! Please help me congratulate Cymeer Brown who scored 36 points, breaking the high scoring record held by Akeem Watkins of 31 points (which was obtained vs. Penn Christian School in 2007-2008) .CCCS Lions finished with a 64-45 Victory over Toby Farms last evening.